Paul Jackson - Any information about Arthur Stanton died in the Holditch pit disaster 1937? 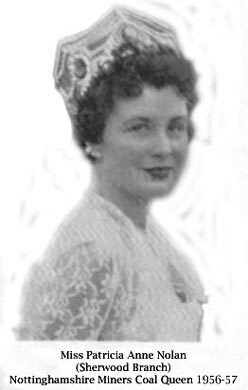 Karen Walsh - Anyone any memories of working with Nolan family members from Mansfield? Kathleen Johnson - Racecourse/Boothen Colliery. What was the occasion? I worked at Babington /Cinderhill Colliery from 1956 to 1960 as an apprentice coal face electrician, also I was born at Watnall and I can remember the colliery there. Do you have anyone who worked at these pits or lived at Watnall who I can contact. Subject: Racecourse/Boothen Colliery. What was the occasion? Hello, I wonder if you could have a look at the attached photo. c) would there be any records anywhere about this colliery. You may use the photograph on your site if it is of use to you. This is my assumption, I think the occasion was a record amount of coal in the tubs eg 19 cwt. plus and 18 cwt. plus. Because these tubs hold about 10 cwt normally. of small coal. These tubs have been packed with large solid lumps well above the top of the tub, giving more weight. b) Men working in teams ie stall and pillar work are in twos and threes, but up to twelve's and sixteen's on longwall faces. One would be nominated as team leader, hence their names tub's produce.. I hope you do not mind me contacting you. My Great Grandfather was killed in the 1912 pit disaster at Cadeby and I am wanting to visit the area to see if there is any memorial. Do you know if the people killed were buried in Old Denaby and do you know the name of the grave yard? Thank you for any help you can offer. Subject: Anyone any memories of working with Nolan family members from Mansfield? 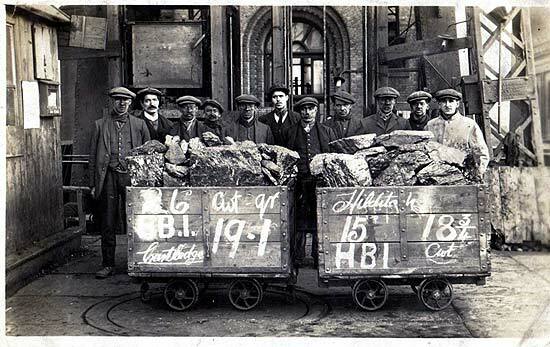 I just wanted to say that I came by a bit of family history recently, that being of my great grandfather John Nolan who worked at Sherwood Colliery during the 1912 strike. He was an Irish man who stood over 6 feet tall. He was also mentioned in a book written by (Lord) Bernard Taylor entitled 'Up Hill All The Way'. Sounds like he was a bit of a character- that's all I know of him, though it would be nice to know a bit more. Maybe there's more to know. I think my grandfather Bernard Nolan worked at the same pit. I never met either due to sad circumstances, so just meet them through the memories of those still living now. Can anyone give me a bit more information. Miner John Nolan jnr. holding future coal queen Patricia. 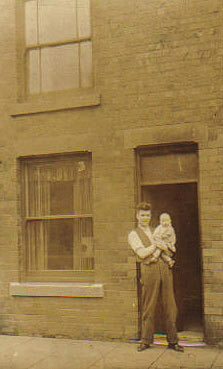 Taken 1934 outside 100, Blake Street (now demolished). 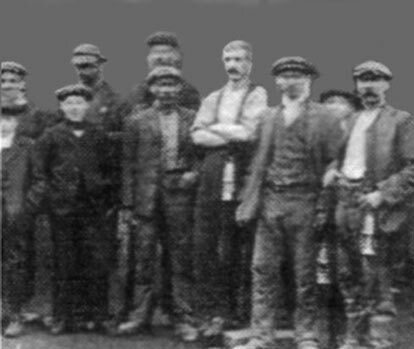 My great grandfather John Nolan standing in white shirt and folded arms outside Sherwood Colliery 1912 coal strike. Anyone any memories of working with Nolan family members from Mansfield? There were many! Please can you tell me the dates the program of the BBC Radio Four 'Women in the Pits Surviving Wigan Pit Brow Lasses' was recorded and is there a copy of the Program available to purchase.